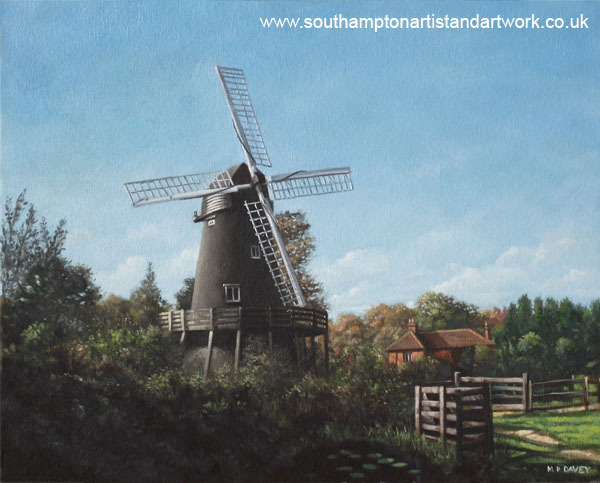 This is an oil painting of the working windmill at Bursledon, Southampton. It is the only working windmill in the county of Hampshire, UK, and is currently undergoing maintenance. It is hoped that the restoration will be complete in 2014, when the mill celebrates its 200th anniversary. Visitors are able to see flour being produced at Bursledon windmill, and view the other vintage farm buildings on the site, as well as the nature reserve. This was painted in the winter of 2012 in oils on a canvas measuring 16" x 20". It is based on a photograph taken during September 2011. The image is quite timeless in a way, with nothing from the 20th century in the scene. It was surprising to the artist to find that the windmill is painted in matt and gloss black paint, rather than a more 'woody' appearance. He believed that it could create a flat looking painting with the black colour reducing the amount of construction that could be shown, and meaning that the overall image would be dull. Fortunately the autumn light did help to show the form of the building however.